Swiss Chard: the most beautiful green! Chard is one of those delicious full season greens that is quite a show-stopper with it's rainbow of colors! We love to grow it largely because it's so darn pretty. It's also yummy and nutritious to both humans and our non-human garden neighbors. Chard is great on many levels: it's a hardy green and unlike most greens that turn into little wilting pansies in the summer heat, it can keep on producing all season long. In more mild winters (like this last one), it can survive in the high tunnel without heat under its frost blanket, which is why we are starting to get such great harvests from it now! It also maintains its mild flavor year round, and its stems are generally tender and delicious in the spring through fall (sometimes I don't even eat the leaves and just enjoy the stems!). We start our early planting of chard in the greenhouse in mid-March and transplant it out into the field in late April. 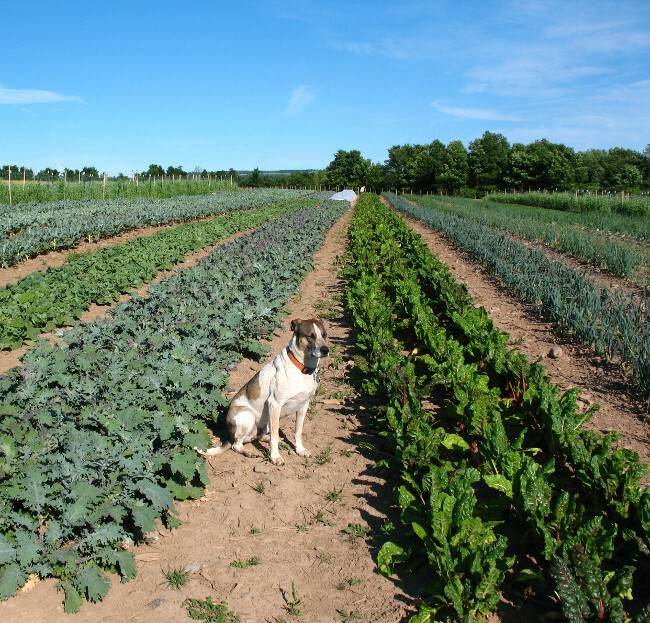 We generally start harvesting from the plants by mid-May, and they can hold up through 6 to 8 weeks of harvests (so we do a few more plantings to keep the crop coming). If you grow chard at home (and you should--it's a great vegetable for first time or experienced gardeners), it keeps producing longest if you just harvest a handful of leaves from each plant at a time, letting the small leaves alone so they can keep growing. Chard is pretty reliable and generally a healthy plant. The few things it can't handle are drought and pests. The last two summers we had a rough year on the chard front thanks to our vicious herbivorous neighbors. Early spring rains exploded the slug population, followed by the summers' biblical plague of locusts (okay, actually just grasshoppers, but they seemed to be around in biblical quantities), and then the fall deer salad bar (chard, along with beets, are their favorites). 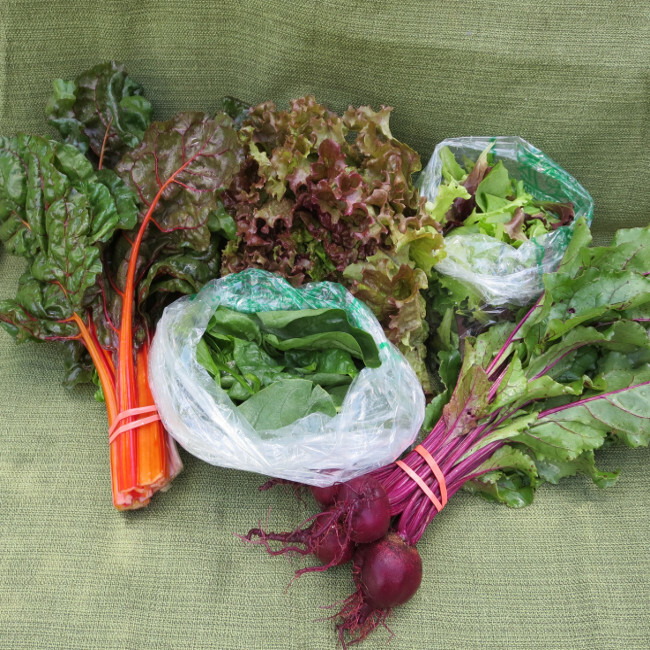 Chard comes in a truly amazing rainbow of colors ranging from white through yellow, orange, brown, and more. We particularly love some of the iridescent oranges! On our farm, we actually just grown a rainbow mix of chard, so the seeds come all jumbled together in a rainbow. While we do get some requests for the all white stemmed chard, that one is just too coveted by our slug friends for us to grow it well. Botanically, chard is a beet grown for nice leaves, just like beets are essentially chard grown for their roots. Chard's flavor is much mellower than beets, and mirrors more the spinach flavor (which makes sense since spinach is another cousin of chard). You can see its connection to beets though in the intense coloration of its crunchy rainbow stems! The best thing about chard compared to spinach is that chard is more nutritious and doesn't have as much oxalic acid in its leaves like spinach does, so it's easier to digest and milder in flavor. Chard comes from the Mediterranean region, and is totally not from Switzerland, but just picked up the "Swiss" part of its name after a Swiss botanist wrote a description of it in the 1600s. Wash chard leaves well before using--because we generally plant them so early in spring, they get exposed to a lot of harsh, rainy conditions (and usually a hailstorm or two), which can splash a lot of grit up onto the leaves. Also, their popularity also encourages bonus protein riders. We field wash them to remove the bulk of stuff that's not chard, but it's always good to wash them again yourself! If you are eating chard raw, you will want to spin the leaves dry. If you are cooking it, you can skip this step since the extra moisture will help in the cooking. Chard can keep up to a week or so in the fridge--just make sure it stays hydrated! We usually wrap ours in a plastic or veggie bag and keep it in the crisper. We grow three or four plantings each of bunched and baby loose leaf chard, depending on the season. Based on its age and size, you might want to prepare your chard different ways, though our default preparation that works for all sizes is lightly cooked. Baby chard and early harvested chard are super tender and great raw. The longer we harvest off of a planting, the sturdier the chard leaves become, so they hold up great when sauteed or cooked a bit. Winter grown chard (like what we have now) has small, super sweet leaves, but is best cooked since it's coming from plants that have been in the ground since September! Raw: Young, tender leaves can be enjoyed chopped up and raw in salads. They are also great when used wilted by a hot dressing, or served as a bed for a meat dish. Sauteed: We quickly saute chard often, starting with the stems (chopped up like celery), with the greens added a few minutes later. Young chard generally cooks up in 2 minutes, older chard may take up to 5 minutes. Any Standard Greens Preparation: Chard can be steamed, boiled, added to soups, or used in baked casseroles (like spinach in a lasagna). With Eggs: Chard is phenomenally complementary with eggs. Honestly, it's my go-to green for omelets, frittada, quiche, egg drop soup, and more. There's just something about how it blends with eggs! We usually steam or saute the leaves before adding it to an egg dish so that the leaves don't stick up and get burned. However, I am fond of a quick snack where I saute the chard and then crack and scramble a few eggs over them. Substitute for other Greens: Most of the time, you can substitute chard for almost any recipe calling for cooked greens. It can easily fill in for beet greens and spinach (since it's so closely related), but it can also suffice when kale, broccoli raab, or other cooking greens are called for. Freezing: Chard is great to freeze for winter soups. You can just quickly blanch the leaves (I usually do 2 minutes), dump them in a cold water bath, drain, and freeze in a zip lock in soup-sized portions. I usually chop them to the desired size before blanching. We hope you enjoy your chard! We'll have some at our April farmers markets, and then it will take a break until it's reappearance in late May and those first CSA shares!